He was born on 27th December, 1881, Paush Shukla Saptami. He was given a name: Chandreshwar. When he was less than 5 years, he had an illumined vision of Shri Krishna and subsequently lost his eyesight through small pox. His Guru’s name was Swami Ramanand. He moved around on foot when there were no trains, no electricity, from village to village and made the people remember Sanatan Dharma. 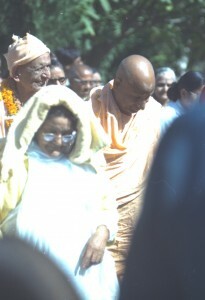 His main disciples were Swami Sarvanandji Maharaj, and Swami Govindanandji Maharaj. He made the people aware of their main religious Granth, the Vedas. He brought the various branches (Sampradayas) under the common flag of the Vedas. He published the 4 Vedas in a single book form and distributed it to over more than 700 places. Sri Ma would meet him from time to time. For example in early February 1973 she was in Naimisharanya for a special function to install the four volumes of the Vedas as deities at the Puran temple. This was organised by the blind Sanyasi Gangeshwaranandji. As the holy scriptures were carried in a procession, MA sang in praise of the Vedas. Another such occasion was Pune in December 1977, where Sri Ma went mainly for the sake of the blind Swami, who was then 95 years old but still hail and hearty and very active. He had made it his task in life to revive and spread the knowledge of the Vedas. A Veda Parayana had been arranged by Sri Nagpal every evening for 7 days and Swamiji gave highly interesting talks every evening for an hour in the presence of Sri Ma. Swamiji has the rare gift of remembering whatever he has heard once, and thus he is very learned. His veneration for Sri Ma is extreme and he regards her as his ishta. He has visited foreign countries several times to spread Vedic wisdom. In 1981 Sri Ma attended Swamiji’s birth celebrations in Mumbai. He passed away in February 1992 at the age of 111.